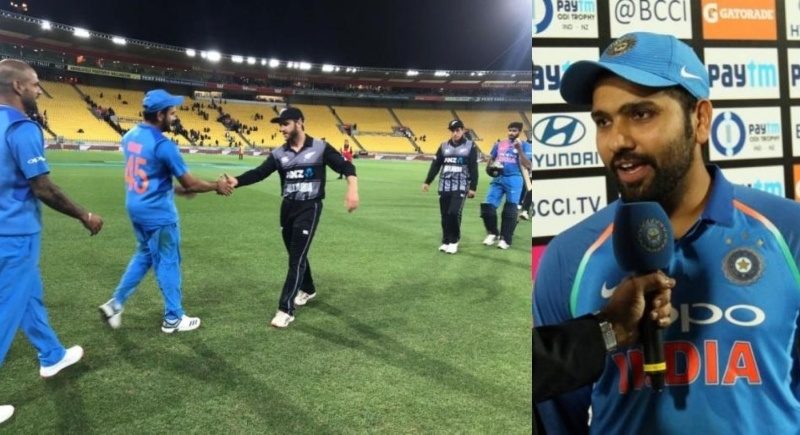 Hamilton, February 11: After savouring their biggest ODI series win on New Zealand soil, a first ever T20 series win would have been a cherry on top for the Indian Cricket Team, but the hosts had held their nerves to pull off a thrilling four-run victory on Sunday at Seddon Park. In an engaging contest, New Zealand slammed 212-4 off their 20 overs and India’s spirited reply came up five runs short of victory at giving the Black Caps a 2-1 series victory. But accepting the defeat gracefully, Indian Captain Rohit Sharma said his team will return home with lots of positives despite a "disappointing" 1-2 defeat in the three-match T20 series. “Disappointing to not cross the line but we fought well right till the end. 210 odd was always going to be tough, but we were in it till the end. They held their nerve and kept hitting their Yorkers”, confessed Rohit at the post-match presentation. “Still lot of positives, we started well with the ODIs, wanted to do well here but the boys throughout the tour were excellent, put in a lot of hard work. They will be disappointed tonight but we've to learn from the mistakes we made and move ahead”, he further added. India will next host Australia for two T20s and five ODIs, starting in Vizag on February 24. For his explosive 72 off 40, New Zealand opener Colin Munro was named the Player of the Match in Hamilton; while after finishing as the top run-scorer, with 139 runs at a strike rate of 173.75 at the top of the order, Tim Seifert was named the Player of the Series. New Zealand captain Kane Williamson also expressed that his team will take a lot of confidence from the T20 triumph against India into the home series against Bangladesh. “Brilliant high-scoring game, a great advertisement for T20 cricket. The first performance was our best, there were learnings in the second game. Both teams put in strong performances tonight, we did slightly better”, Williamson stated.